(Nanowerk News) Cornel Sultan, assistant professor of aerospace and ocean engineering at Virginia Tech, is the latest faculty member at the university to learn he has received a National Science Foundation (NSF) Faculty Early Career Development (CAREER) award. Sultan joins a phenomenal list of more than 70 Virginia Tech CAREER award winners, of which some 60 have been members of the College of Engineering since the award was created in 1994. 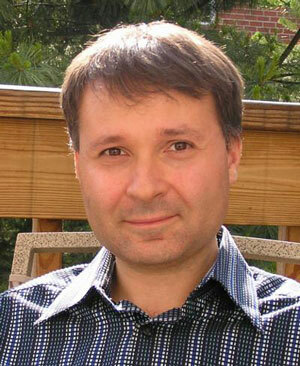 He will receive some $400,000 from NSF to help him in his research and teaching endeavors. Cornel Sultan, assistant professor of aerospace and ocean engineering at Virginia Tech, is doing research to apply cell structural integrity and morphing capability to a range of applications, from energy harvesting from vibrations to robotics. Sultan, who joined the AOE department in 2007, is looking at biological discoveries to develop new controllable structures that, in engineering terms, have "tensional integrity" or tensegrity. This concept means that the integrity of the structure is primarily due to its tensioned elements. "For example, in biology the membrane, intermediate, and actin filaments of a living cell's framework are crucial in achieving structural integrity and morphing shape capabilities as well as allowing for its sensing, control, and information transmitting functions," Sultan said. Sultan, who spent two years at Harvard University as a research fellow studying the mathematical modeling of biological structures, said his research could lead to improvements in multiple areas. His findings could further the understanding of the connection between heart disease and a cell's structure, aid tissue and organ reconstruction research, and explain how nature controls motion in a fast and energy efficient manner. When the biology is applied to engineering principles, Sultan believes the resulting mathematical models and control strategies will be "critical in validating tensegrity applications such as space telescopes, antennas, and robots, thus enabling the jump from feasibility to implementation." This research will also advance new applications in energy harvesting from large vibrations, morphing structures, and robotics, and will impact art and architecture, where the current trend is to use assemblies of cables, bars, and membranes for lightness, transparency, and increased urban aesthetics, he added. "Cornel's work successfully bridges multiple disciplines in a way that is especially applicable to aerospace engineering as autonomous aerospace vehicles are steadily decreasing in size and increasing in functionality. Energy-harvesting and shape-changing are just two of the functions that his bio-inspired approach to vehicles is going to revolutionize," said Christopher Hall, AOE professor and department head. Sultan, the co-holder of one patent on an orthopedic implant, is a reviewer for the American Institute of Aeronautics and Astronautics Journal, Journal of Guidance, Control, and Dynamics, Journal of Aircraft, International Journal of Solids and Structures, International Journal of Space Structures, Institute of Electrical and Electronics Engineers Transactions on Automatic Control, Automatica, and the Journal of Sound and Vibration. Among his honors, he received a 1996 NASA Fellowship, a 1998 Puskas Fellowship from Purdue University, and two United Technologies Research Center Publication Awards in 2006 and in 2007. He also earned a Romanian Outstanding Student Fellowship in 1990, 1991, and 1992, given to only the top one percent nationally. Just prior to coming to Virginia Tech, Sultan spent three years with the United Technologies Research Center of East Hartford, CT., in a senior technical leadership position. He was the principal investigator for its autonomous formation flying helicopters control project in cooperation with the University of California at Berkeley. He was also task leader for the Sikorsky swash-plateless rotor helicopter and the Pratt and Whitney mission adaptive propulsion control projects. Sultan earned his master's in mathematics and Ph.D. in aeronautics and astronautics degrees from Purdue University.